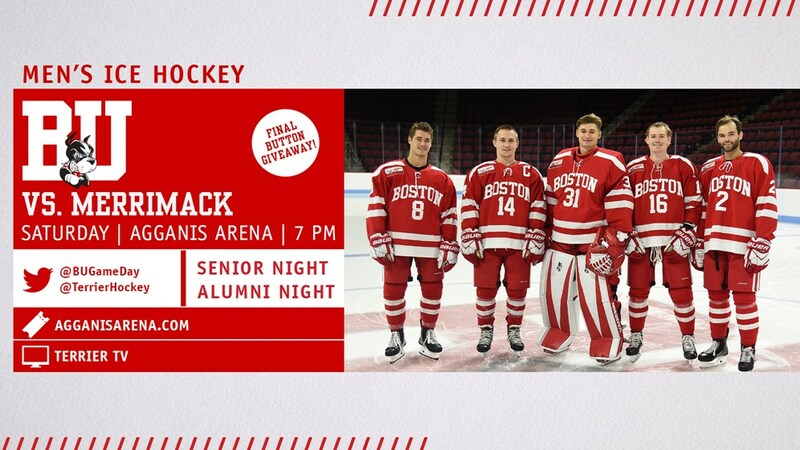 On Senior Night, Terriers host Merrimack in their final regular-season home game. Currently in fifth place in Hockey East, BU will need to win its final two games and see Lowell and/or Northeastern lose their final games to move into a home ice slot for the conference playoffs. 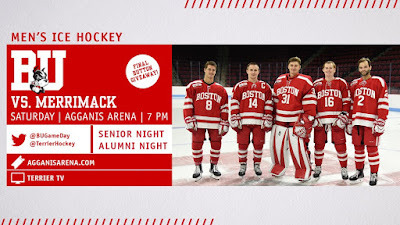 Puck drop is set for 7 p.m.
After Thursday’s tie against Providence, BU enters the game on a four-game unbeaten streak in which goalie Jake Oettinger has yielded just two goals. In two earlier meetings, BU defeated the Warriors, 7-2, in January, after having been blanked, 4-0, in October. A second radio broadcast will be available on TRSN as a student crew will produce the first-ever Mandarin radio broadcast for a men's college hockey game. 2019 recruit Robert Mastrosimone scored his 22nd goal and added an assist in Chicago’s 5-3 loss to Dubuque. He has 43 points in 39 games for the Steel. 2019 recruit Ethan Phillips scored his 11th goal and added an assist in Sioux Falls’ 4-1 win against Tri-City. He has 32 points in 34 games for the Stampede. 2019 recruit Dom Fensore scored his fifth goal in the NTDP U18s 11-0 rout of Madison. Case McCarthy recorded an assist for Team USA. 2020 recruits Dylan Peterson and Luke Tuch each contributed an assist in the NTDP U17s’ 4-3 win against Sioux City. Jack Eichel scored his 23rd goal in Buffalo’s 4-3 overtime win against Pittsburgh. Evan Rodrigues assisted on the game-tying goal in the comeback win. 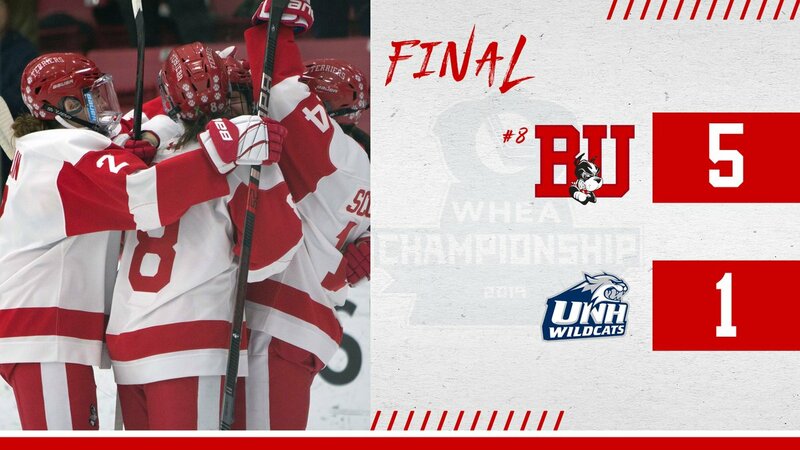 Behind two goals apiece from Sophomore Nara Elia and freshman Mackenna Parker, the #8 Terriers took game one of its quarterfinal series with New Hampshire, 5-1 at Walter Brown Arena. 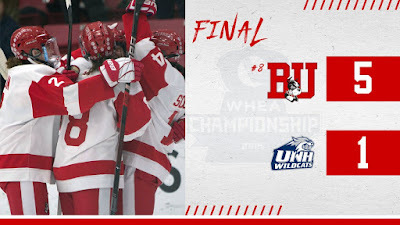 Freshman Courtney Correia had the other BU goal, as BU sprinted to a 4-0 lead before the Wildcats got on the board in the third period. Sammy Davis and Jesse Compher each had two assists while Corrine Schroeder stopped 25 UNH shots. Game 2 is set for 3 p.m. today. Compher has been named to the Team USA roster for the 2019 Women’s World Championships in Espoo, Finland, April 4-14.